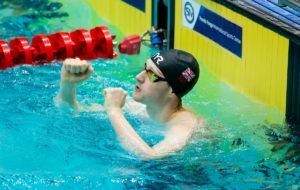 While we’re waiting on the official British Swimming roster for this summer’s World Championships, let’s take a look at the medal standings by club from over the past week in Glasgow. 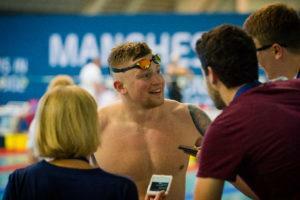 While competing on the final day of the 2019 British Championships, Luke Greenbank brought the house down with a dominating performance in the men’s 200m backstroke. 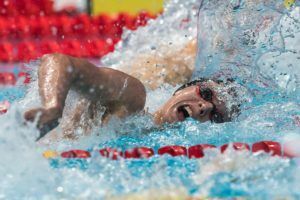 The Wisconsin Badgers rolled to victories on both sides on Friday, as sophomore standout Beata Nelson showed her versatility by taking wins in events she doesn’t usually swim. Nelson has been swimming almost exclusively backstroke, IM and fly this year for the Badgers, but she took on the 100 breast yesterday. The outcome was positive, as she dropped a 1:03.62 for a commanding win. That time is a PR by almost four seconds, marking her first venture under 1:07. A big drop in an off event is to be expected, but it looks like Nelson’s IM training is paying off in her weakest stroke. In addition to leading off Wisconsin’s winning 400 medley relay (splits unavailable), Nelson also split a 22.59 on their victorious 200 free relay to close out the meet. The Badgers mainly swam off events, though some notable wins for them included a 1:49.71 for Jessica Unicomb in the 200 free as well as a 2:05.28 for freshman Alex Reddington in the 200 fly. Freshman Matthew Novinski posted a season best in the 200 back, going 1:47.80 for the win. 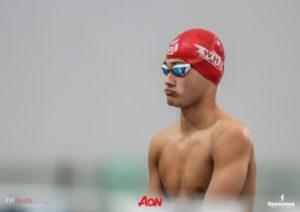 His best time of 1:46.86 is now less than a second away– he achieved that time this past spring at YMCA Nationals. Todd McCarthy got his hands to the wall for two wins, first taking the 200 free (1:40.34) and then the 100 fly (49.41) to help Wisconsin secure the team win on the men’s side. GREEN BAY, Wis. (GreenBayPhoenix.com) – The Green Bay swimming and diving teams celebrated 16 seniors today at their last home meet of the season. While the Phoenix were topped by the Wisconsin Badgers, they did come away with two major individual victories thanks to senior Stephanie Garvin and sophomore Riley Darling. 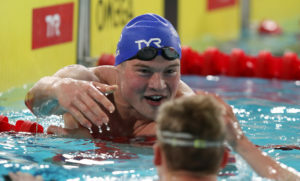 Darling won the men’s 200 butterfly with a new pool record, touching the wall at 1:50.40, almost two seconds ahead of a second-place Badger. Garvin won the women’s 1000 freestyle with a best-ever in-season time of 10:24.95, almost four seconds ahead of a second-place Wisconsin swimmer. The Badgers did not bring any divers, but the Northern Michigan divers traveled to compete in a friendly exhibition for the Phoenix on Senior Day. On the women’s 1 meter board, senior Bailey Wagner finished first with a score of 262.50, with sophomore Ele Higley not far behind with a score of 257.02 for second. Redshirt senior Crystal Franzwa rounded out the top three with a score of 241.12. On the men’s 3 meter board, the divers went 1-2-3, with senior Michael Klemm leading the way with a score of 303.90, sophomore Josh Yahr earning second with 284.84 points, and sophomore Derrick Prenottaking third with 268.20 points. On the women’s 3 meter, Wagner took gold again with a score of 276.67, while Franzwa dove well to earn a score of 261.45 for third. For the men’s 1 meter board, Klemm ran away for first again with a score of 301.57, while Yahr took second with 264.07 points. Prenot hit the board and was not allowed to finish his set of dives. There were multiple other events where the Phoenix got their hands in before the Big Ten competitors. In the men’s 400 yard medley relay, the team of sophomore Ricky Davis, freshman Max Boehnlein, sophomore Riley Darling, and freshman Ben Redman each performed well split-wise, and combined to finish second with a time of 3:25.46. In the men’s 100 backstroke, senior Brian Borden was the second finisher, touching the wall at 52.22, with teammate Charlie Warren close behind at 52.60. In the women’s 50 freestyle, junior Alicia Hanson posted a season-best 24.00 to sneak into third place, while on the men’s side, Redman saw similar results after touching at 21.40. Freshman Anna Liu stopped the clock at 52.98 in the women’s 100 freestyle, good for third. For the men, Redman was back again, netting third again with a final time of 46.82. Senior Alec Rutkowski was the top finisher in the men’s 200 backstroke, earning third place with a time of 1:55.08. Freshman Malynn Tarczewski was the first Phoenix to finish in the women’s 200 breaststroke, stopping the clock at 2:31.21 for bronze. On the men’s side, redshirt senior Andy Cooper also was third, touching at 2:10.36. Garvin finished in the top three again in the 500 freestyle, finishing with a time of 5:08.68. Freshman Paul Sadergaski was a second-place finisher in the men’s 100 butterfly, earning a final time of 51.58. Finally, the men’s 200 yard freestyle team of Redman, junior Nick Garcia, freshman Reagan Ragsdale, and Sadergaski touched second with a time of 1:25.07, less than a second behind the Badgers. The final score was Badgers 159, Phoenix 95 for the women and Badgers 152, Phoenix 102 for the men. Green Bay has now reached the peak of their training, and will show up to compete next weekend at the IUPUI House of Champions Invitational in Indianapolis, Indiana from Friday, November 17thuntil Sunday, November 19th. GREEN BAY, Wis. –- The Wisconsin swimming team dominated Friday night’s dual meet at Green Bay, taking home two team wins and owning the fastest time in 26 of 28 events. The Wisconsin women won 159-95, and the men’s team claimed a 152-102 victory. The reigning Big Ten Freshman of the Week, Matt Novinski won the men’s 200-yard backstroke with a time of 1 minute 47.80 seconds, outpacing the runner-up by over 6 seconds. 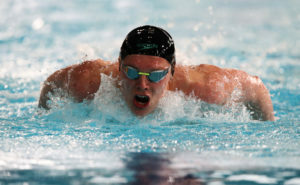 He also finished second in the 200 IM (1:55.72), finishing behind victorious teammate Chris Wills (1:54.65). Senior Marissa Berg posted a strong showing, claiming individual victories in the women’s 50 freestyle (23.65) and 200 IM (2:02.52), and taking part in the winning 400-yard medley relay squad (3:44.30). The Badgers will be back in action tomorrow morning, as they stay on the road to take on Northwestern in Evanston, beginning at 9 a.m.